It was December 6, 1954. The site was Phoenix, Arizona. And with those words, L. Ron Hubbard began what would become the preeminent ACC on the subject of Communication, its application to exteriorization and the making of Clears. Point of fact: This was not just another Advanced Clinical Course, but the culmination of an entire era of development that began with the 1st ACC and now embraced the crucial component that would monitor all auditing into the future. The attainment of exteriorization and overcoming barriers to its accomplishment by every being. Not only the development of processes to that end but, more importantly, ones that auditors other than Mr. Hubbard could apply with success. And it was a key point. For L. Ron Hubbard had long noticed that what he could accomplish in auditing did not necessarily match what other auditors were capable of accomplishing. Whether they should have been able to achieve his same results mattered little to him. Planetary clearing required more than one auditor. And so the intensity of his research, in both training auditors and developing processes they could apply, was every bit as important as researching the beingness and capabilities of Man himself. The first plateau had been reached with the 7th Advanced Clinical Course and the codification of all those processes he’d now found workable in the hands of other auditors. First releasing these materials as Intensive Procedure and then as the Auditor’s Handbook, Mr. Hubbard had now expanded its text to the fully comprehensive The Creation of Human Ability. Then, to accompany the book, he handpicked specific lectures from the Advanced Clinical Courses that corresponded with a study of the book. Issuing them as the Professional Course Lectures (and then later under the embracive title the Phoenix Lectures), Ron now had the curriculum comprising basic Professional Auditor training. Next, to see to its dissemination and application, Mr. Hubbard conducted and supervised the 8th Advanced Clinical Course encompassing a full study of The Creation of Human Ability, the Phoenix Lectures and further lectures which, point by point, detailed the application of every technique and procedure. Yet his work was not done. For while he had codified the route that was Scientology, he also had the link to even greater application for every case from the very bottom to the very top. More specifically, while the goal could now be summed in a single word—Exteriorization—another word was the singular factor of importance in its accomplishment: Communication. So it was that, while conducting the 8th Advanced Clinical Course, Mr. Hubbard had been simultaneously writing another book. In that regard, even its title bore great significance. For having advanced the subject from Dianetics to Scientology, the previous two years (1952 through 1954) had solely addressed the latter subject. However, with the breakthrough of communication, he now had the crucial link to unify both subjects—Dianetics and Scientology—into a combined whole. And therein was the content of the landmark Dianetics 55! A Congress was scheduled for broad announcement of these discoveries and invitations were sent the world over, to both Dianeticists and Scientologists. Meanwhile, and in preparation, L. Ron Hubbard immediately convened the 9th ACC to teach Professional Auditors the skills and processes of the forthcoming Dianetics 55! now rolling on the printing presses. Here, then, is the 9th American Advanced Clinical Course—an in-depth professional study of Dianetics 55! And where, throughout thirty-four lectures, Mr. Hubbard elaborates upon and demonstrates its underlying theory, formulas and processes with emphasis on application by auditors. 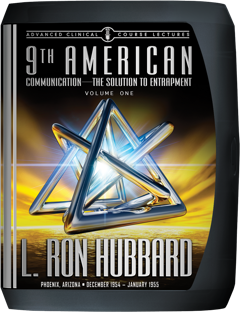 Here, too, is L. Ron Hubbard detailing the mechanics of communication, the Communication Formula in full and its use as a process in Communication Processing. Here, finally, is Mr. Hubbard instructing on the Six Basic Processes—from their very nature (drawn from the Definitions and Axioms of Dianetics and Scientology) to auditing demonstrations of each one: Two-way Communication, Elementary Straightwire, Opening Procedure of 8-C, Opening Procedure by Duplication, Remedy of Havingness and Spotting Spots in Space. In testament to the stable plateau of technical development, L. Ron Hubbard would not deliver another Advanced Clinical Course for twelve months. For it was now time to put these landmark discoveries into application. And when he next met with student auditors, it truly was something new. For in evidence as to where his track of research and development had taken him, he had now formed the Founding Church of Scientology in Washington, DC.